the Lilac City, and their lilac festival that proceeds annually on the third Sunday in May, is a great family friendly event to enjoy. Like many cities in Washington, Spokane is careful to maintain harmony with its many surrounding natural attractions. Kayaking and rafting are very popular around Spokane, with various reputable tour companies standing by to help you get out on the white water. Downtown Spokane is home to all the shopping and eating you would expect from a large city. Speaking of “large,” Spokane is home to the Monroe Street Bridge, which is the largest arch bridge in America. You’ll also find here one of the country's best hotels: The Davenport Hotel and Tower, which is famed for its unique architecture, luxurious beds, and excellent cuisine. 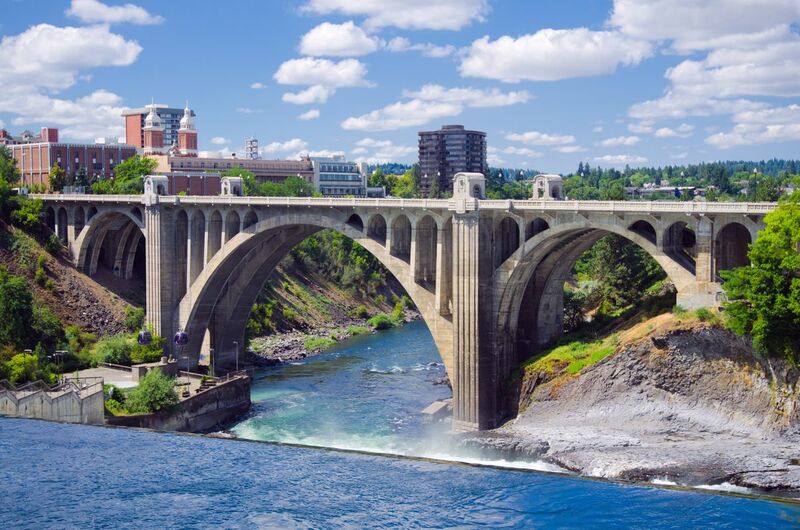 Visit Spokane, and enjoy a surprisingly rich vacation destination that can be thought of as an oasis of activity in the expansive surrounding farmland. Spokane is a great place to come anytime of year. There are four very different seasons which serves as a great all around place. Spokane is great because you can drive 10-30 minutes in any direction and be in the middle of no where. So it is great for star gazing. Spokane is also in the middle of many amazing places. There's courd Alene 45 minutes away and a variety of lakes ranging from 45 minutes to two hours away from Spokane making it a great place for a summer get away. In the winter, Spokane is surrounded by mountains covered in snow these mountains range from 1-2 hours away. Plus mount Spokane is 30-60 minutes away making it a great place for a day trip. Coming to Spokane means that you will have a relaxing and fun stay whenever you come. I particularly enjoy looking at the scenic old brick buildings. That really makes Spokane what it is. "What were you doing in Spokane?" is the usual response I got from people when I said I went to Spokane last summer. The surprise aside, Spokane was a wonderful destination. It has a lot to offer. The waterfall in the middle of the downtown was fantastic! It's also a home of Spokane and Kalispel Indian Tribes. Spokane (Children of the Sun in local Native American language) is in eastern Washington State, about 300 miles east of Seattle, 15 miles west of Idaho, and less than 100 miles from Canada. It is a city of about 200,000 in the city boundaries, nestled on the Spokane river, and ha a history of fur trading, gold and silver mining, agriculture and timber, and now some technology and bio-tech health care industries. The Lilac City's motto is "Near Nature, Near Perfect". Spokane is a fantastic unsung-hero of a city in remote eastern Washington. A nice small city great as a destination or as a gateway to the surrounding great outdoors. Just passed through as with Seattle, Portland and the other US cities whilst on the Greyhound across the border states on the way to Fargo, North Dakota and it seemed like quite a nice place! If I'd have stayed on the bus beyond Fargo then I would have ended up in Chicago because that was the bus' final destination, couldn't though so ended up travelling North instead of East! Brrr! !